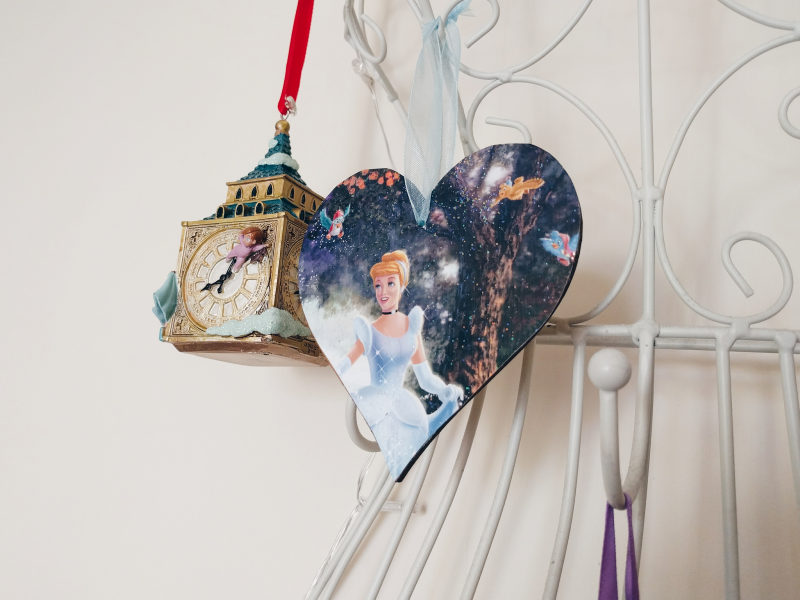 First up is this gorgeous Cinderella heart plaque from itslizi. I've been trying to fill up a wire mannequin I've got on my wall with Disney decorations as a sort-of alternative Christmas tree so I knew I had to order one of Lizi's Disney heart plaques! I'm so in love with it, it's covered in a subtle layer of glitter so it catches the light beautifully and it's the perfect size for my "tree"! As Halloween was this month I also have some Halloween-y favourites! I watched Hocus Pocus for the first ever time on Halloween and I honestly loved it so much! I can definitely see why it's such a popular film with Disney fans. This will be a permanent Halloween fixture from now on! 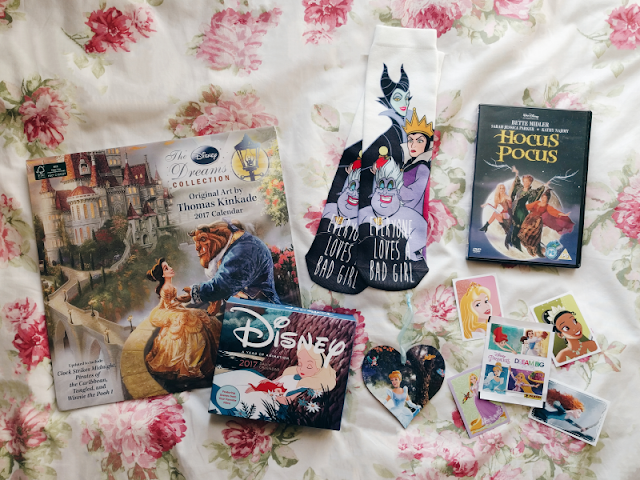 As you may remember I organised a Disney-themed Secret Santa-type event on Twitter for Halloween (post on it here) and the person who ended up sending a gift to me was the lovely @titchtamsin from Little Glitter. Unfortunately the first gift that Tamsin sent out ended up getting lost in a post but she kindly insisted on sending out a second one for me which arrived the very next day! 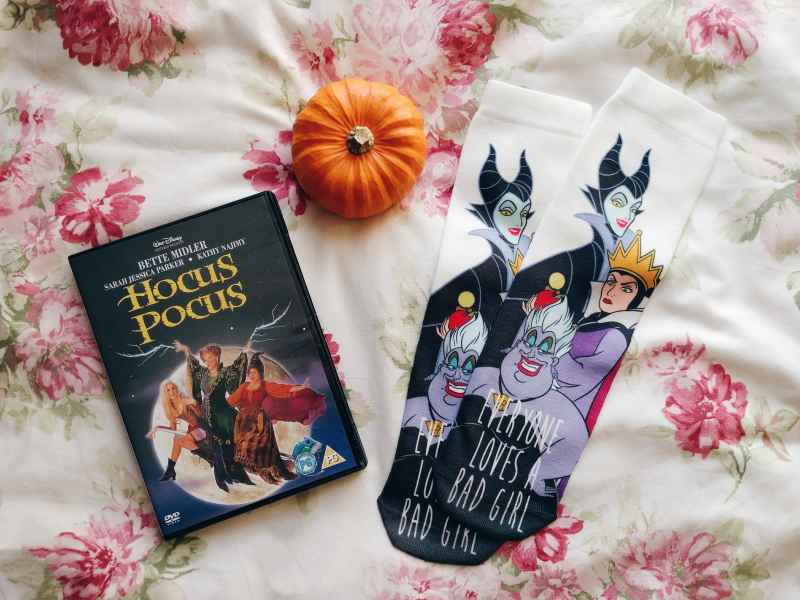 You can see the lovely things she sent here but my favourite had to be these Villains socks which I believe are from ASOS. How amazing are they?! Thank you Tamsin! One weekend while I was visiting my boyfriend he bought me a load of these Disney Princess Dream Big stickers from Panini completely out of the blue! I'd not come across them before but they're so pretty! 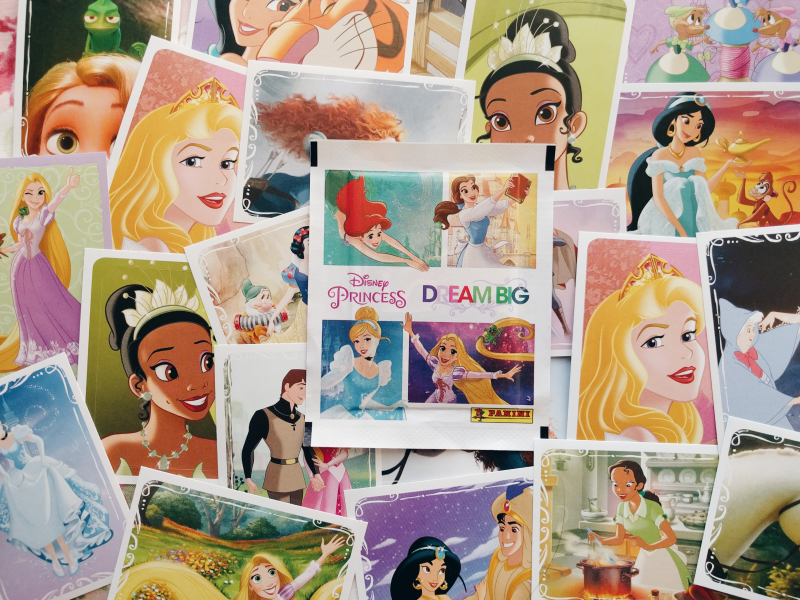 I was tempted to buy the corresponding sticker book to go with them and try to collect them all but I think I want to save them to do something crafty with! And last but not least are these Disney calendars that I've picked up for next year. I'd been desperately wanting these as I'd seen them all over Instagram throughout this year so I wanted to get my own for 2017. However as I've been short of money so I was worried that I wouldn't be able to afford to buy these before they sold out. Luckily my boyfriend's parents kindly gifted me with some spending money earlier this month for my birthday so I went straight to Calendar Club to pick these up! 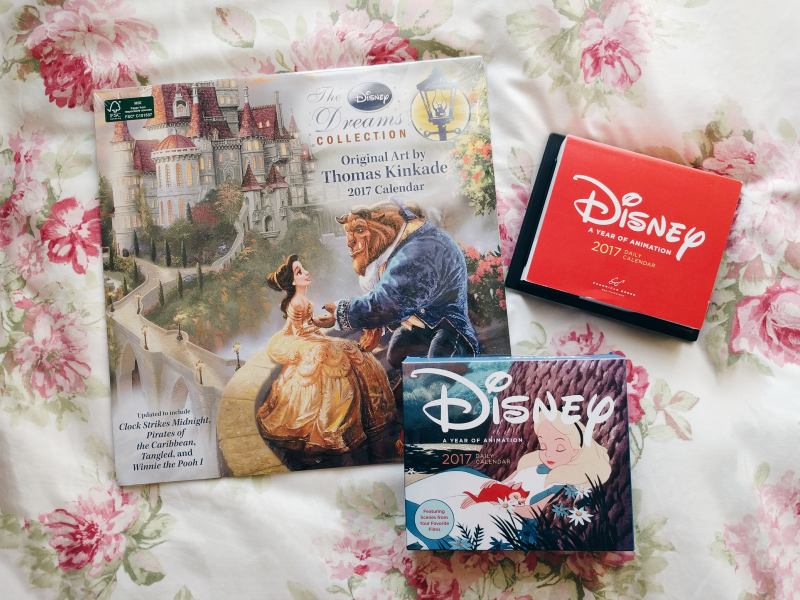 I'm especially excited about the Thomas Kinkade one - I'll definitely be framing some of the pictures once I'm finished with the calendar! And finally, my non-Disney favourites. I've been in love with Patisserie Valerie's beautiful mugs ever since I first stepped into one of their cafes so with the leftover birthday money I had from my boyfriend's parents I bought one of my own! I've also been trying to increase my intake of fruits and vegetables this year and I recently came across these Bear fruit Yoyos which are 1 of your 5 a day and have no added sugar! 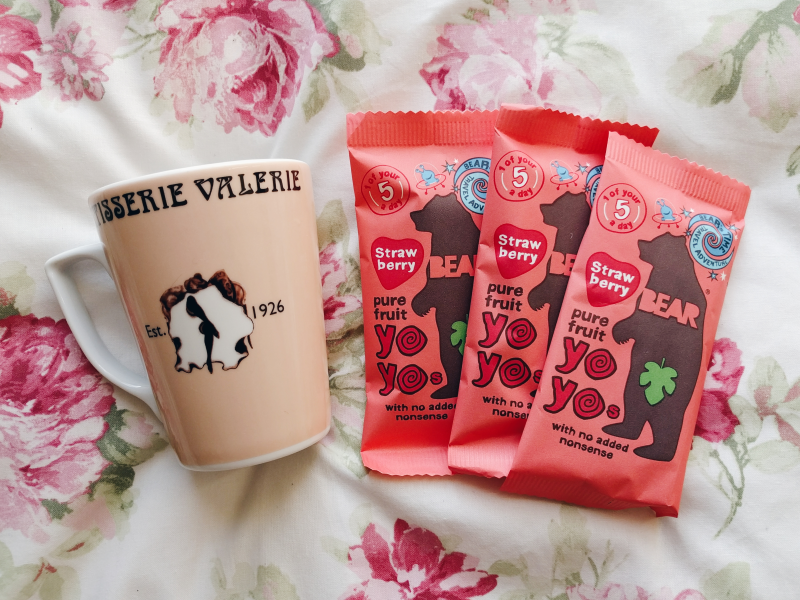 They're so easy to pop in your bag for on the go so these will definitely be coming with me on my train journeys now! Hope you had a lovely October!